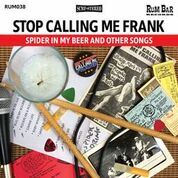 Can I take an album called Spider In My Beer And Other Songs by a band called Stop Calling Me Frank seriously? Do I have to even? No, of course not. But make no mistake, this album is great fun and played with a level of enthusiasm that makes sure I am listening and give it the credits due. Stop Calling Me Frank is the kind of band that I might find on a city jazz festival evening in the back of some bar or other cranking it out to great fun of all present. Every one is stomping around, swigging beer, hopefully without the spider in it. Rock is all around, a harmonica on fire over it all. Blues faves, 'Johnny Be Goode' and other rock and roll classics and 60s classics will be played and sung along to. 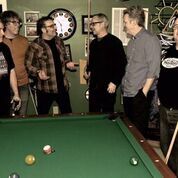 Reading the story of Stop Calling Me Frank, I am not surprised to find a band coming back together after 30 years of working and raising kids. The past decades were also used to hone some songwriting skills, surplanting the covers of old. Older and wiser, bigger probably in the wrong way, the band returns to the Boston scene on fire. With its mix of rock, powerpop, garage rock (hear that saxophone honking) and a mild form of punkrock there's not one song on this selection that does not have that deep groove. A groove to move to, dance to, party to. Spider In My Beer ... offers that in abundance. Those expecting a sense of subtlety in their music are at the wrong address here. Stop Calling Me Frank rocks on, mildly at a mimimum, but always tight, without too many frills on offer. With prominently mixed in drums followed by a tight bass and rhythm guitar, it is only the saxophone and an occasional guitar lick or solo that is allowed to escape that tightness. It results in music that is meant to move to. Think 'Louie Louie', The Ramones, 'My Sharona' and you will get the picture. If your still failing in imagination here, just listen to 'Drinking After Work' and you will get all drifts surrounding this band. Spider In My Beer ... is not for all occasions, but for all those that I like a little wildness and abandon in my music. Just to dance around for a few moments in the living room, just for the fun of it, this is my album. It could/should be yours to.